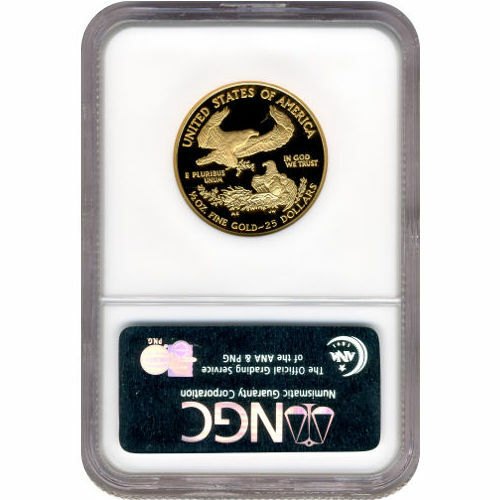 Proof Gold American Eagle coins are part of a larger program of official sovereign coins from the United States Mint that include gold, silver, and platinum coins. The Gold American Eagle program is the most diverse, with three different versions and four weights struck on an annual basis. 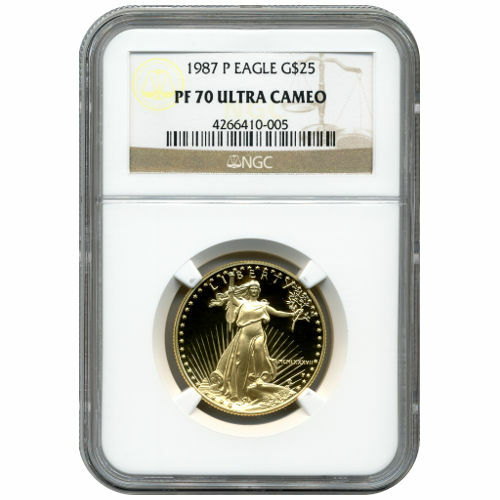 Today, Silver.com offers the 1987-P ½ oz Proof Gold American Eagle coin for purchase in perfect condition. Coins ship in an NGC protective plastic slab. Consists of a total weight of one-half troy ounce of gold. Gold American Eagle coins were first introduced in 1986 in both bullion and proof versions. While the bullion version of the coin debuted with four weights in total, 1 oz, ½ oz, ¼ oz, and 1/10 oz, the proof coin was only available the first year in the full 1 oz weight. These 1987-P ½ oz Proof Gold American Eagles were the first fractional-weight coins struck in the proof version. One year later, in 1988, the United States Mint expanded the proof program to include the other two fractional-weight coins, the ¼ oz and 1/10 oz. On the obverse face of all Gold American Eagles is the image of Lady Liberty created by Augustus Saint-Gaudens in 1907. His image depicts Liberty as she guides the nation forward into an unknown future with confidence. Featured in full-length, she strides confidently forth from the nation’s capital, the sun setting at her back, as she holds a torch aloft to light the way. Sculptor Miley Busieks’ depiction of a family of nesting bald eagles graces the reverse of the coin. Her image was created in 1986 and is used exclusively on the Gold American Eagle program. Each coin in this Silver.com product listing has a perfect PF70 grade from the NGC. Perfect proof coins are characterized by their full, original luster and a lack of detracting flaws. Ultra-cameo defines the strong, frosted finish of the design and the deeply-mirrored, clear background field. If you have questions, don’t hesitate to reach out to Silver.com at 888-989-7223. We’re also available online using our live web chat and email services. If you are interested in similar products, be sure to check out our full selection of Gold Bullion.